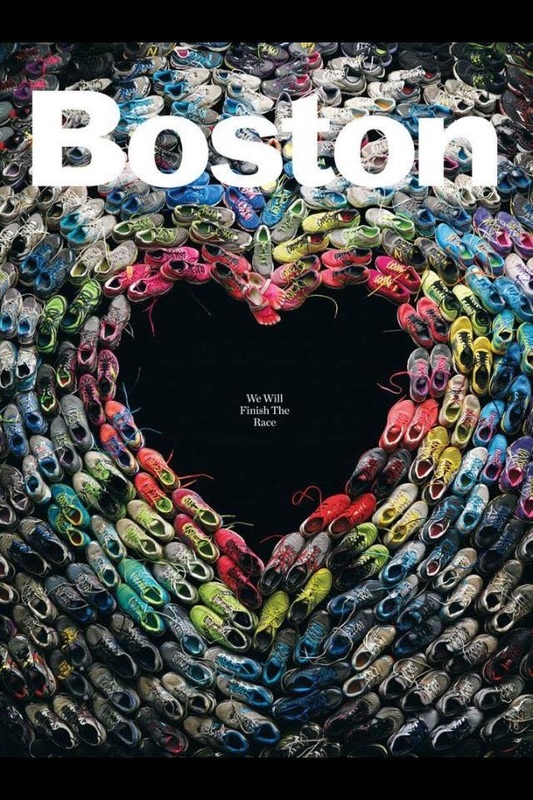 This was my 5th Boston Marathon and by far, the most memorable. I had been tracking the weather as soon as the 10 day forecast was available. Each day the temperature dropped, the percentage rain increased and for one of the first times, the weathermen were spot on. The night before the race the wind picked up and sleet pelted the skylights and I closed my eyes hoping for the best. We woke up to the sound of a plow truck and jumped out of bed to see the damage. The ground was covered in snow and it there was a mixture of sleet and freezing rain. I had initially planned on wearing shorts, tank top, sleeves, hat and a throw away shirt. Before leaving the house I grabbed as much as I could for ‘just in case”. I ended up grabbing warmer gloves and a buff for wind. Funny how those shorts that I packed wishing for the best never left my bag! The drive to pick up the bus was frightening. We followed a plow truck down the big hill to get to the main road. We were about a ½ hour into the drive and almost slid off the road as they were covered with a mixture of slush and snow. The rain/sleet was coming down so hard it was difficult to see. Finally after a lot of sweating we arrived in the parking lot to get on the bus. As we boarded the bus the channel 8 news team was filming us. The bus arrived at the parking lot at the school in Athletes Village. This was the first year I never got off the bus until it was time for my wave to be called. Looking outside the rain still hadn’t let up and was coming down sideways and steady. I was bundled up with my tank top, arm warmers, light jacket, throw away shirt and garbage bag. We started our walk to athlete’s village trying to avoid puddles and fighting to stay warm. I was already shaking from the cold and the buff I had on was already wet as I felt the cold on the back of my neck. When we got to Athletes Village I couldn’t believe what I saw. In the past years people were camped out underneath the tents and there were long lines to the port-o-lets. This year the tents were almost empty. The mud looked like quick sand and the water was pouring off the roofs. Runners were covered in plastic bags walking around the back of the school. The rain was like a waterfall off pouring the roof of the school. I remember a runner trying to get up a little hill and their sneakers covered in mud. I can’t imagine how people were getting up the incline without wiping out. The grounds were covered with plastic bags, broken umbrellas, muddy sneakers and throw away clothing. The crowds were barely moving towards the corrals as the wind picked up again and now the rain turned to sleet. My feet were already soaked as the rain poured off the garbage bags that were keeping my body dry. Finally what seemed like an hour we finally arrived at the corrals. The announcer was yelling “just find any open corral and start running”. 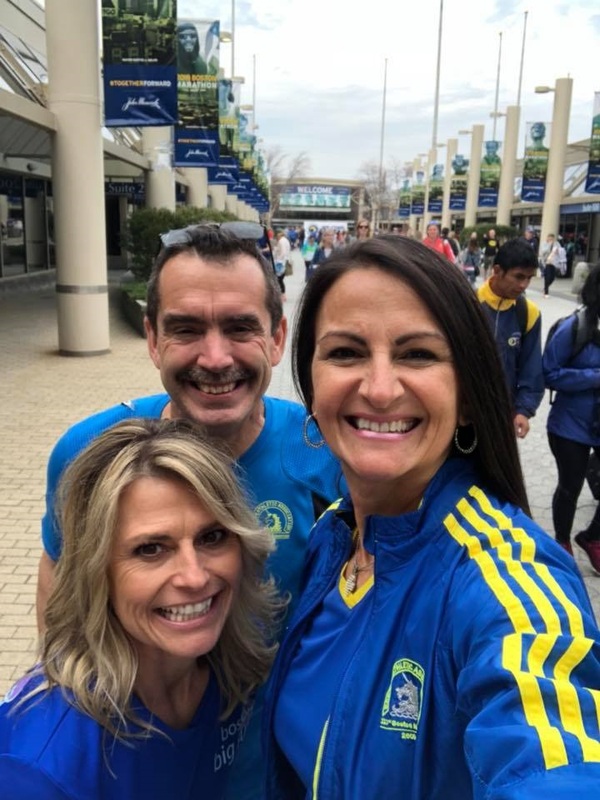 There was no warm up, no waiting, we started running before we reached the corrals and just kept going as we crossed the starting line. This was my first time I forgot to start my watch until I was about ½ mile in. Probably because it was buried under all my clothing. After I turned it on it went back under my clothes until the end of the race when I turned it off. I had no clue what pace I was running. I just knew I had to keep moving. The first few miles went by pretty quick. I was fighting to get warm. My hands were warm due to the hand warmers. I finally ripped off the plastic bag as my core temperature started warming up. My feet took a bit longer to get warm. The roads were overflowing with puddles that were unavoidable. There were moments that I felt okay and thought to myself, “I am warming up! My hands aren’t frozen”, and then the unthinkable would happen, the wind would pick up and the rain relentlessly would plaster my face. I would start to shiver and just put my head down and kept moving. The volunteers at the water stops were my hero’s. They all had their words of encouragement and never led me to believe that they “had it” too. Being out there for hours they triumphed and braved the weather. I did notice the cups were filled almost to the top but looking back, it was probably rain water filling them. 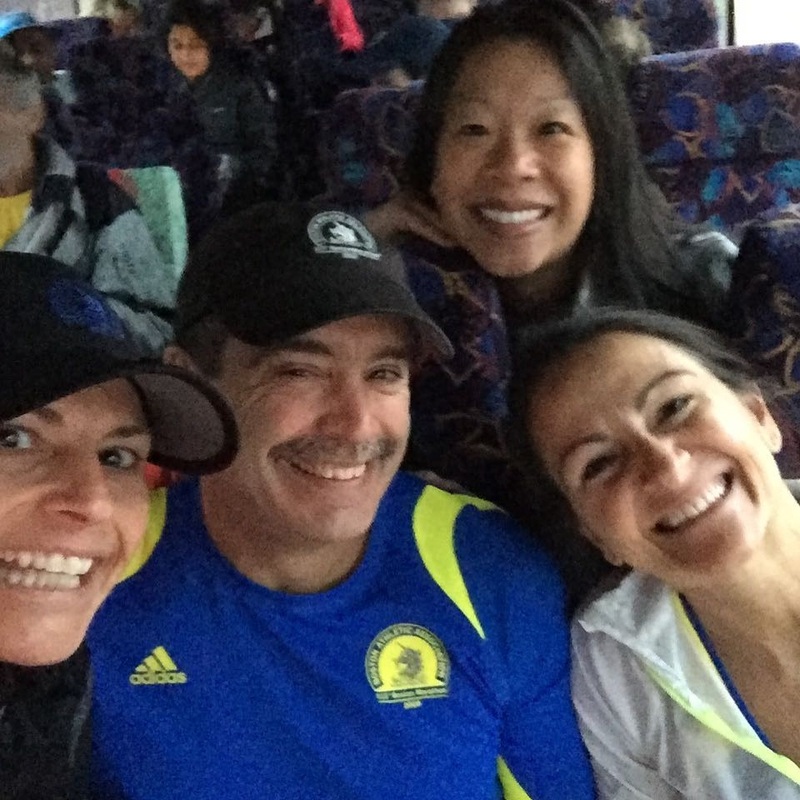 I remember around mile 16 my wrists felt funny – like I was being hit by something hard. My hands were beyond frozen and my hand warmers now were in balls frozen wet in my gloves. I tried to take off a glove to get rid of one but my fingers stopped working. I ran for a bit holding the wet glove as I couldn’t get it back on my hand. My friends were waiting on Heartbreak Hill with dry gloves and hand warmers. That kept me going through those next 5 miles. Finally we arrived on Heartbreak Hill! I spotted my friends that were like Angels. I tried to get my gloves off for the exchange but my fingers couldn’t function. I looked at my dear friend Reggie and said “Help me”. I felt like my voice was gone. I had nothing left. A runner yelled to me “hey I have that shirt”, I tried to reply and I said with a faint voice “It’s a throwaway but I’m too cold to throw it away”! She didn’t hear me, in fact I am not even sure if I said it out loud. My quads were cramped and so painful to run with each step. I took salt a couple of times on the course. I brought a spare tube of Base Salt for that “just in case” I can’t open the salt pills as they were in small baggies. When Kim’s hamstrings started to cramp I reached for the tube of Base Salt, popped the top and both used it. It saved us! Miles seemed to be going by faster at this point. My sneakers were soaked beyond wet and my throw away men’s oversized shirt was drenched. It felt like I had a sock or something in my tights and after looking at photos I realized the shirts was stuffed between my legs. All I could think was “boy am I going to be chaffed down below”! The crowds were still cheering and encouraging runners throughout those final miles. 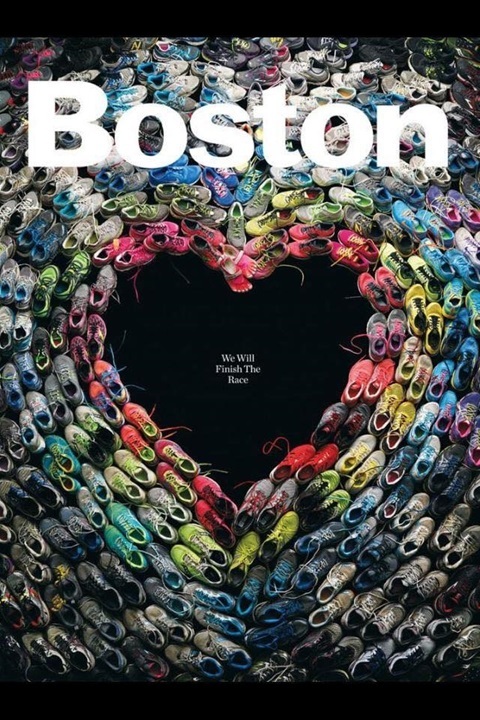 There is nothing like the crowd support at Boston. I high fived a couple of little kids and smiled as I started to get closer to the finish. Then I looked up and I saw it. The CITGO sign. I knew I was going to make it. I ran by a blind runner and I could hear their guide saying “okay, there is a slight hill coming up” and I thought how amazing these runners were today. Looking around runners were still covered in garbage bags but never stopped pushing themselves. Finally we turned onto Hereford Street. I knew there was one more turn to get to Boylston Street. I need one good photo! I finally ripped off that throw away shirt, unzipped my jacket to expose my bib and kicked up my pace. By the looks of it every other runner had the same idea. 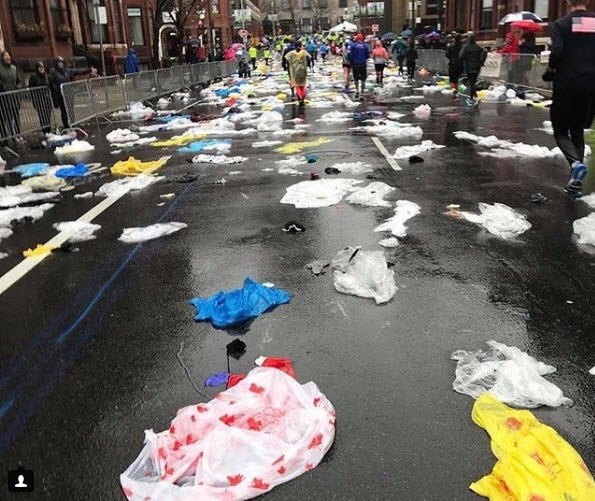 The street was covered with plastic bags and clothing. We turned onto Boylston Street smiling for this exhilarating amazing cheering crowd! I threw my hand in the air and screamed! This is it! I looked at Kim and smiled. He grabbed my hand and we crossed the finish line. I would have cried if I could breathe. There were medics with wheelchairs lined up. I remember when I was getting a heat shield a gust of wind came and the rain started again. It took my breath away. I couldn’t stop shaking from the cold. I just kept walking to get to the hotel to warm up. Finally after what seemed like hours we arrived at the hotel. 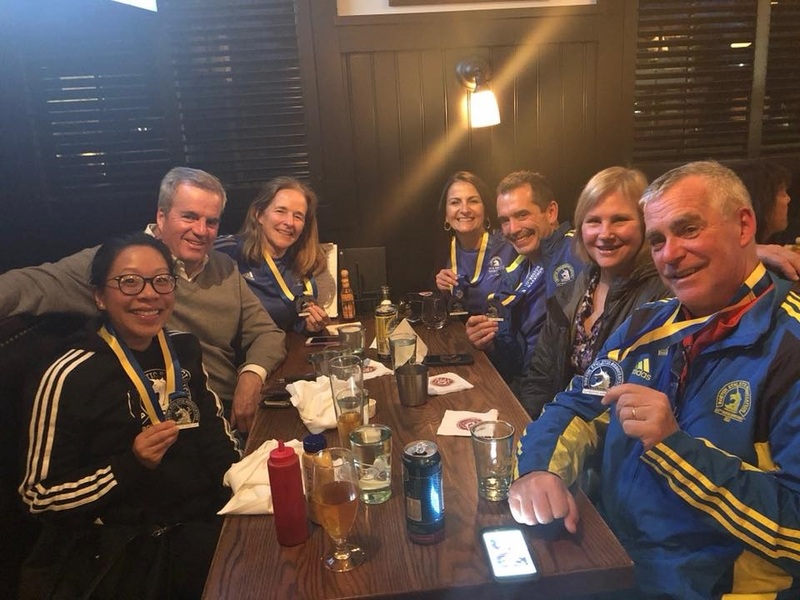 I survived the Boston Marathon 2018 that will be remembered as one of the coldest Boston Marathon’s in 30 years. This may have been the worst conditions to run, but I still wouldn’t change this incredible experience. I think about it and shake my head, I can’t believe that I kept going and finished strong. It’s so true the saying that minds will quit 1,000 time before our bodies will. I never once allowed a negitive thought to take over. I dug deep that day. I never gave up. 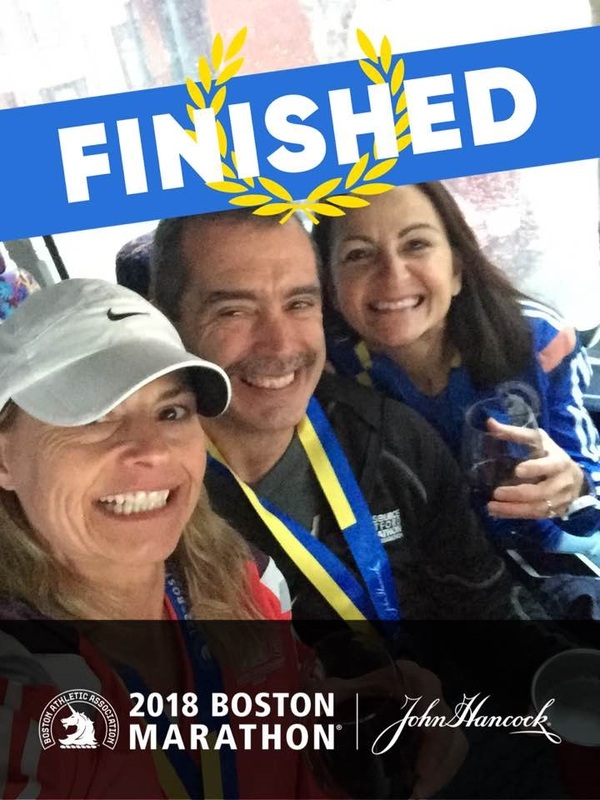 Boston 2018 – DONE!